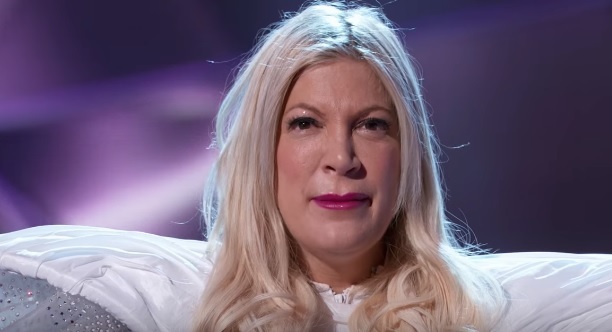 Tori Spelling, 45, is the fifth mystery celebrity contestant to be unmasked in “The Masked Singer” Season 1. She was revealed to be the Unicorn in the fifth episode of the Fox reality singing competition television series. Born on May 16, 1973 in Los Angeles, California, United States, Spelling is the daughter of the late film producer Aaron Spelling and Candy Marer Spelling. Tori is known for playing Donna Martin in the teen drama TV series “Bevrly Hills, 90210,” which aired on Fox from 1990 to 2000. Aired on January 30, 2019 on Fox, “The Masked Singer” Season 1 episode 5 titled “Mix and Masks” featured the Unicorn, the Lion, the Alien and the Rabbit. The group performed “On Top of the World” by Imagine Dragons. Individually, Tori as the Unicorn sang “I Love It” by Icona Pop featuring Charli XCX. The Rabbit performed “Poison” by Bell Biv DeVoe while the Alien and the Lion sang “Happy” by Pharrell Williams and “California Dreamin'” by The Mamas and the Papas, respectively. Tori sang “Fight Song” by Rachel Platten on episode 1 “Mask On Face Off,” which aired on January 2, 2019. The Rabbit and the Alien sang “Livin’ la Vida Lica” by Ricky Martin and “Feel It Still” by Portugal. The Man, respectively, on episode 2 “New Masks on the Block,” which aired on January 9, 2019. The Lion sang “Feeling Good” by Nina Simone while Tori sang “Oops!… I Did It Again” by Britney Spears on episode 3 “Five Masks No More,” which aired on January 16, 2019. The Rabbit and the Alien sang “Wake Me Up” by Avicii featuring Aloe Blacc and “Lovefool” by The Cardigans, respectively, on episode 4 “Another Mask Bites the Dust,” which aired on January 23, 2019. Fox renews ‘The Masked Singer’ for Season 2; New judges?